For nearly three decades, the mysterious region known as Area X has been cut off from the rest of the world. Abandoned by civilization, it has been reclaimed by isolated forms of nature that many scientists are eager to study. Several expeditions have been led into this region, with some reporting back a lush and verdant paradise and others being driven to suicide and murder for unknown reasons. The twelfth expedition, a team comprised of four women from different specialized fields, has just arrived. 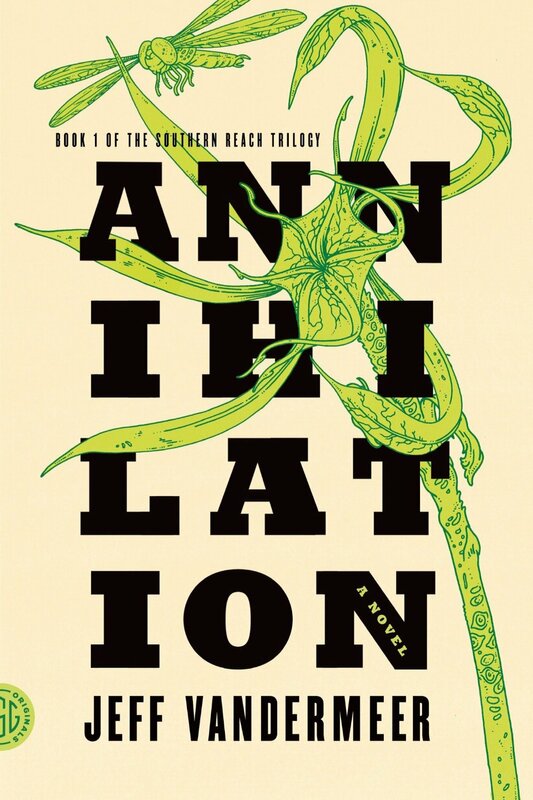 This first installment in Jeff VanderMeer’s Southern Reach trilogy starts off with an ominous tone and creeping suspense. The four women in the twelfth expedition are identified only by their job descriptions. The surveyor is ex-military and edgy about what they may find in Area X. The anthropologist is fearful and wary of making big decisions. The psychologist is manipulative and well trained in hypnotic suggestions. And the biologist, who narrates the story, is eager to find out what happened to her husband, a member of the eleventh expedition who returned home a completely different man before shortly succumbing to cancer along with every other member of his team. The four women are working towards conflicting ends, and these different agendas begin to clash when they discover a deep pit descending into the Earth. The other women refer to the pit as a “tunnel”, but the biologist feels compelled to call it a “tower”. While the Tower is nearby the designated campsite used by previous expeditions, it does not appear in any of the maps or field journals recorded by the other scientists. As the members of the twelfth expedition descend into this pit, they uncover a dangerous secret which threatens their sanity and their lives. The first half of this relatively short novel does a great job of building and maintaining a discomforting sense of dread. Since none of the women are given personal names, the reader feels a kind of detached fascination as they venture into unknown and possibly threatening territory. The biologists interjects the primary narrative with details from her past which show her struggling relationship with her husband and her passion for observing living things. As they descend into the black depths of the Tower, the tension continues to mount as they begin to encounter things that defy the laws of nature. Unfortunately, this level of suspense proves impossible to maintain. The second half of Annihilation veers into confusion and chaos as the team members begin to distrust and doubt one another. The unease of the initial Tower exploration falls apart and is replaced by twists and turns that serve no purpose and to little to further the plot. There’s nothing wrong with science fiction novels that take a wild detour into weird. However, a book that is weird solely for the sake of being weird comes off as both pretentious and annoying. It’s as if VanderMeer deliberately made his conclusion as difficult to decipher as possible in order to find out who would “get it”. I, at least, didn’t get it, and trying to puzzle out the last thirty or so pages just left me with a headache. You can find Annihilation here on Amazon or here on Book Depository.